"He plays what he means, and means what he plays"
"Taking swing to the masses... sheer fun and enjoyment"
Cab Calloway, Louis Prima, ‘Fats’ Waller, Louis Jordan – these superb artists were never afraid to entertain. As well as playing great music, they also looked like they were having the time of their lives whenever they set foot on a stage. Now there is one man who is continuing this grand upbeat tradition of entertaining his crowds with great ‘jumpin’ songs, storming solos and a swinging world class band. His name is Ray Gelato, and he joins his legendary predecessors in continuing the trend of delivering the coolest swinging sounds around. Gelato is considered by many to be one of the last in a long line of the classic juimp-jive, swing and jazz entertainers. Expect to hear some foot-stompin’ bigband tunes that are guaranteed to have you jumpin’ and jivin’ and leave you feeling uplifted and inspired. 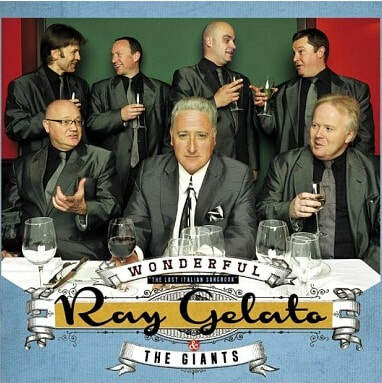 Ray and his Giants play a mixture of swing, jazz, jump & jive and R&B that are unmistakably the band’s own style. This, combined with Ray’s fun and original songs, makes for an unforgettable evening that will leave you wanting more!